One of the most fun aspects of about being a parent is planning a party to make your child feel special on his or her birthday. While a party at home can be a great deal of fun, many parents opt for outside venues to lessen the work involved and provide an entertaining backdrop for the children. Here are some great local choices that you might want to book for your child. Spoiled Rockin' Kidz Salon & Spa is the brainchild of owner Jessyca Hunter, who wanted a special hair salon that catered to kids but also had all the amenities of a regular spa. Everything in Spoiled Rockin' Kidz Salon emphasizes fun and special VIP treatment for kids. Treat your child and his or her friends to spa treatments, a tea party, a fashion show, or makeup glamour. Make your child's special day extra special with an exciting picnic right on the farm. Children of all ages will love birthday parties on a real working Cotton farm, and every party package includes a Hayride or a ride on the Corn Train as well as the fantastic playground. EarlyWorks Children's Museum is the largest hands-on history museum in the South. Children love exploring the museum and hearing stories from the talking tree, playing a tune on the giant-sized instruments at the Alabama bandstand, walking a gangplank, and exploring a 46-foot keelboat. A party at EarlyWorks includes invitations, museum admission, party favors, party space, and scheduled time in Biscuit’s Backyard for children 6 years old and under. For train-loving children, opt for the Happy Birthday Caboose at the Depot. This party option includes all of the basic party amenities on a real train caboose. It wouldn't be Rocket City without including a space-themed party. At the U.S. Space & Rocket Center, you can give your young astronaut an out-of-this-world party experience. They have two different birthday packages to choose from: the Mars Package and the Lunar Package. The Mars Package also includes an IMAX movie, personal pizzas, goody bags, and a host/hostess to assist with your group. Parties are offered only on Saturdays and Sundays. The Lunar Package includes admission to the U.S. Space & Rocket Center for 10 children and two adults, along with a birthday cake, soft drinks, and paper products. Birthday celebrations at the Huntsville Botanical Garden are easy, fun-filled and unforgettable. They have birthday packages ranging from a basic package to a super celebration package that includes a host, three hours in the party area for up to 15 children and adults, a themed birthday cake, goody bags, activities, themed paper products, and lemonade. Choose from ‘Go Fish’ and ‘Sprinkler Fun’ or a from a number of other party themes. Children must be at least four years old. The Huntsville Museum of Art provides a unique birthday experience that includes a Museum Academy Art Classroom rental with a 50-minute art activity led by an art instructor, followed by open party time. Children will have a work of art to take home, along with fun memories. It's important to note that all decorations, invitations, and refreshments must be purchased off-site, and there is a minimum of eight children needed to participate. Up to 15 party guests aged three or older are allowed. Clean-up is done by the booking family, and you have a choice of three themes. For the youngest children, the Young-at-Art package is designed for ages three to five. The Studio Masterworks is intended for ages six and up, and the Animal-Funtastic is reserved for children seven and older. The Benton H. Wilcoxon Municipal Ice Complex offers a really cool place to have a birthday party. 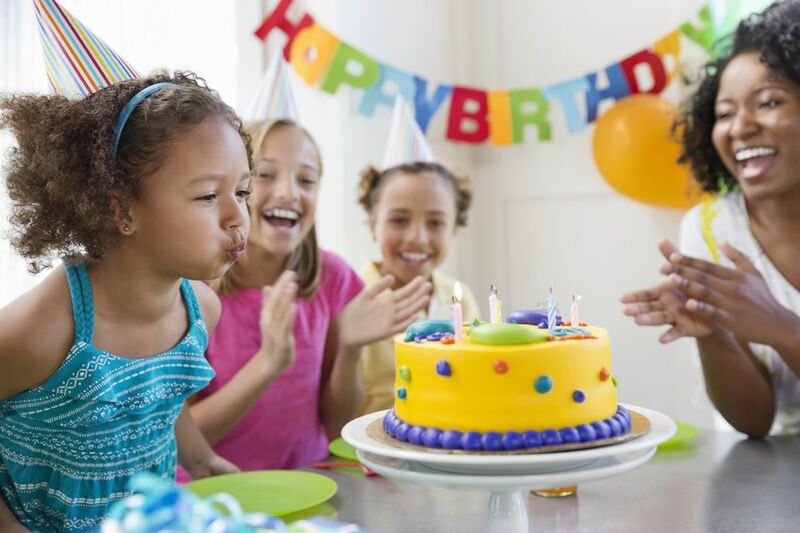 Birthday packages include a party room for the entire session, invitations, two large, one-topping Papa John's pizzas, and a one-gallon pitcher of soda as well as skate rentals for up to ten guests ​and a free skating lesson pass for the birthday child. If you prefer roller skating to ice skating, then you'll want to check out Roller Time's party packages. They range in price from 10 guests to 20 guests, or you can rent the entire rink for up to two hours for a completely private party. Packages include pizzas, drinks, invitations, and skate rentals. Pump It Up is known as "The Inflatable Party Zone" where you can you enjoy a private, indoor party with giant interactive inflatable play structures. A Pump It Up party is a fun and unforgettable event for ages two all the way up to adult. Throw a magical party without lifting a finger. Chuck E. Cheese parties are a totally cool way for your kids to celebrate with the fun of Chuck E. Cheese's, and all you will have to do is relax. Birthday parties reserved Monday through Thursday are a great option to avoid some of the crowds, plus they provide unlimited time at your table and extra tokens. Southern Adventures is a family-oriented water and amusement park offering year-round wholesome entertainment for all ages. Some popular attractions include Two Adventure Golf Courses, Water Park, Go-Kart Track, Carnival Rides, Batting Cages, Bumper Cars, Roller Coaster Simulator, and "The Rock" Climbing Wall. There are over 10 different birthday party packages to choose from, so finding one to suit your child shouldn't be a problem. At The Budding Chef, birthdays are serious business. There are three different birthday party packages to choose from plus an à la carte menu. One party example is the "Sous Chef," which includes a party theme, paper chef hats, and aprons for all guests, all food and beverages, cooking instruction for three cooking projects, all paper goods, and a personal chef party coordinator. The birthday child will receive all of the above plus a Budding Chef special gift.